Massapoag Sunfish Fleet News: 64th MYC Annual Regatta - Day 1 "My God, It's Full of Sunfish"
64th MYC Annual Regatta - Day 1 "My God, It's Full of Sunfish"
The whole lake was full of these! 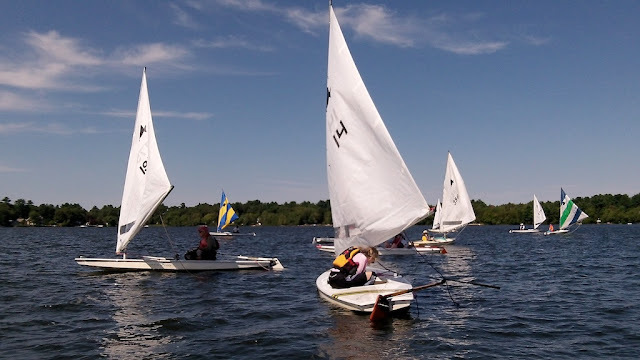 The 64th Massapoag Annual Regatta got off to a roaring start start today, with 24 Sunfish (a new club record), on the line for today's racing. The weather cooperated beautifully with sunny skies and a west wind blowing about 10-12 miles per hour. In the A fleet, there was plenty of pressure on the course, both from the wind and from the competition, as leads changed several times, and top prizes were pretty evenly spread. The winds got squirrely and light as the day wore on, making windward mark roundings a definite challenge, especially since the Sunfish shared the course with the Flying Scots and Day Sailers adding their own special brand of confusion to the mix. Sometimes the lake looked more like an obstacle course than a regatta! At the end of the day, MYC's Gary Werden sat atop the A Fleet leader board, and Mark Stoughton continued his late season hot streak to dominate the B Fleet with 6 firsts in 7 races. Well done! How do you decide who is in the A and B fleets? Skippers declare themselves before the racing starts. There is a shared start, and the fleets are separated out afterwards when posting the scores. In hindsight I should have chosen the A fleet, because there is a huge gap between the A and B finish times, and all day I finished with the A group. If I went with them, I'd be in about 12th-13th place. I also didn't post scores because there are some issues with them that Leo Berendes was going to sort out overnight. If they have corrected ones posted, I'll tweet a photo of them today. How did your races go yesterday? The New England Laser Masters was a lot of fun. !0 races completed over 2 days in warm sunny weather and all sorts of wind strengths. About 50 boats racing including some of the top talent not only from New England but also from Canada, Dominican Republic and New Jersey to name only three foreign countries represented. I had very mixed results. Best result was a 6th but overall I did well enough to win the trophy for 3rd place in the Incredibly Old Geezer Age Group. Tell Gary and Dave that they missed the best Laser racing anywhere in New England this weekend and that nobody has ever said on their death bed, "I wish I had spent more time sailing Sunfish in Sharon when I could have been sailing Lasers in Newport." Are you going to go to the Sunfish Worlds? Congratulations! 6th place in almost any Laser fleet is a great finish. Even finishing in the Old as Moses fleet is an accomplishment. Dave finished just ahead of me in every race except one, where he fell out of the boat rounding a mark. Gary was so far ahead of me I never saw him, except at lunch and dinner. They might be Laser guys, but they did really good imitations of Sunfish zealots by the end of the racing. I opted out of the Worlds. I was asking around this weekend and I got a pretty lukewarm response from people who've been there who also know how I sail. The consensus seemed to be that I need more high level racing experience before tackling the Worlds. MYC 4th Annual Regatta - Day 2 "Blow me Down!"